Christmas Time Is Here! Happiness And Cheer! A Charlie Brown Christmas Live on Stage will bring holiday cheer to Boston with a limited engagement at the Boch Center Shubert Theatre from November 29 – December 2, 2018. 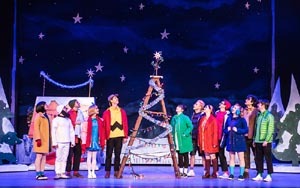 This touring production of A Charlie Brown Christmas Live on Stage by Charles M. Schulz features everyone’s favorite Peanuts gang – Linus, Lucy, Snoopy, Sally, and more, all led by the lovable Charlie Brown – as they discover the true meaning of Christmas. When Charlie Brown becomes discouraged by the materialism of the season, Lucy convinces him to direct the neighborhood Christmas play. In typical Charlie Brown fashion, things go awry when he selects a tiny fir tree for the production. It’s up to Linus to save the day and remind everyone of the real message of the holiday. A Charlie Brown Christmas Live on Stage, Schulz’s timeless story of the spirit of Christmas, showcases the unforgettable music of Vince Guaraldi, performed by a three-piece ensemble on stage, as well as a concert of beloved holiday carols led by the Peanuts characters. Based on the popular Peanuts comic strip, the Emmy® and Peabody Award-winning television special by Bill Melendez and Lee Mendelson became a holiday viewing tradition after it first aired in 1965. It was adapted for the stage by Eric Schaeffer, by special arrangement with Arthur Whitelaw and Ruby Persson. A Charlies Brown Christmas Live On Stage will play the Boch Center Shubert Theatre for 11 performances from November 29 – December 2, 2018. Advanced tickets go on sale to the general public on Friday, March 16 at 10:00AM and are available at the Boch Center Box Office, bochcenter.org, or by calling (866) 348-9738. Groups of 10 or more may reserve tickets now by contacting Boch Center Group Sales at (617) 532-1116 or groups@bochcenter.org.